I still can’t believe the Holiday season is right around the corner. So today I wanted to share an easy tutorial on how to do a glam half top knot. This hairstyle has been all over in 2015, and it can work perfectly for the Holidays. It will make a cozy outfit a little bit more fun….it will work with edgier looks…and it will also make a sequin dress modern and hip. Using the right shampoo and conditioner will make a difference in the texture of your head. I recently went again to Sally Beauty, which is always my go-to for salon-quality hair, skin and nail essentials at the best prices. I asked for their best line of moisturizing shampoo and conditioner- my hair is very dry from having ombré and bleaching it for the past two years. The sales associate at the store was very helpful and she recommended me the ZP 180 PRO Moisture Repair Shampoo and the ZP 180 PRO Moisture Repair Conditioner. After just one use I felt instant and deep hydration; it says it is formulated with ultra-reparative Pro-Peptide Complex and can repair up to 2 years of hair abuse. My hair is so frizzy and unpredictably curly that I have become addicted to the blow dryer when it comes to hairstyling (hey, I’m not the only one). 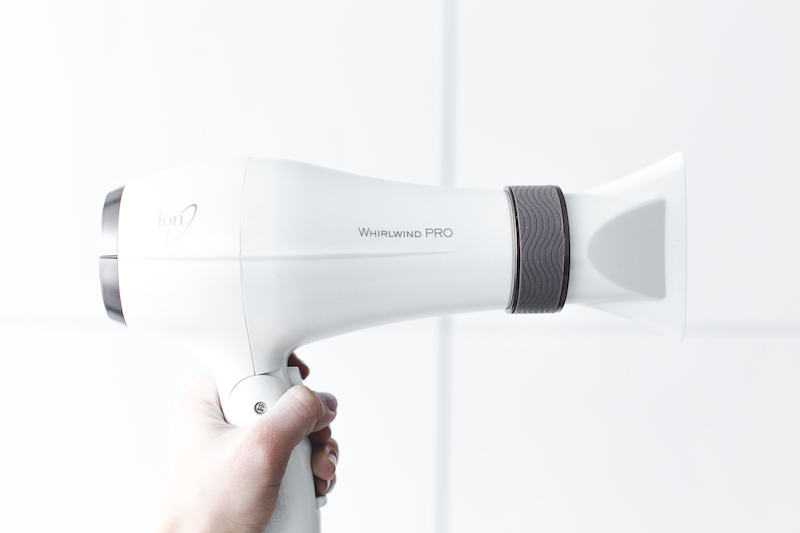 Recommendation: Ion Whirlwind Pro Oscillating Dryer, which has a unique automatic oscillating technology (this distributes airflow more efficiently meaning less drying time, and less damage). If your hair is curly like mine, focus on making the roots straight (the ends don’t have to be perfect). If your hair is straight, put the blow dryer in the low temperature setting and use a diffuser. You can wear this hairstyle straight, wavy, or curly…but I like giving my hair a little texture so I’m using the Hot Shot Tools XL Ceramic Curling Iron 1 1/4 inch. I’m just focusing on giving it more of a messy look. For example, I try to only use hot tools twice a week. Try washing it at least every other day, let your hair produce its natural oils…and washing it less also means that you don’t need to use hot tools so often. Use a heat protectant. Don’t have it hidden in your bathroom…have it right there beside your blow dryer so you never forget. Here I’m using “Beyond The Zone Smooth Criminal Thermo Protect Spray”- this one seals the hair cuticle against temperatures up to 450 degrees F.
Don’t start blow drying your hair when it’s VERY WET- wait until at least 50% of it is damp. The less heat you have to apply to your hair, the better…and it doesn’t have to be dripping to make it manageable. Know your hair’s heat tolerance. Every hair is difference; some hair types can handle heat styling better in the long run. Also take into consideration that if your hair has been chemically processed, it’s heat tolerance will be lower. 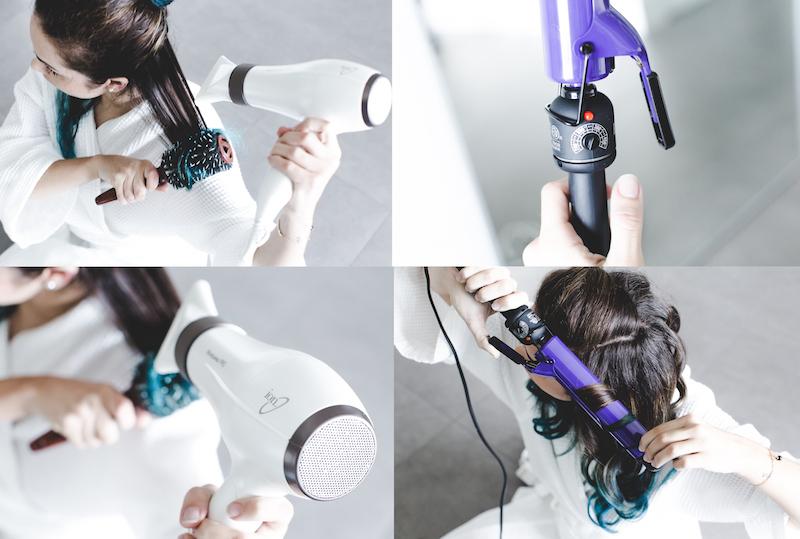 You don’t always have to put your curling iron at its highest…play with it, know your hair! Here is a general guide. If your hair is fine, don’t go higher than 300 degrees F. If your hair is medium: try between 300 and 375 degrees F. If your hair is coarse, you can go up to the low 400s. To reduce hair damage in the long run, hold the blow dryer at least 6 inches away from your hair. Using a Pintail comb , section your hair off to do a half ponytail. You can make it as high or low as your want. You can also use as much hair as you want. Some people go from the ear diagonally up…but I like to section it off where a receding hairline would start. 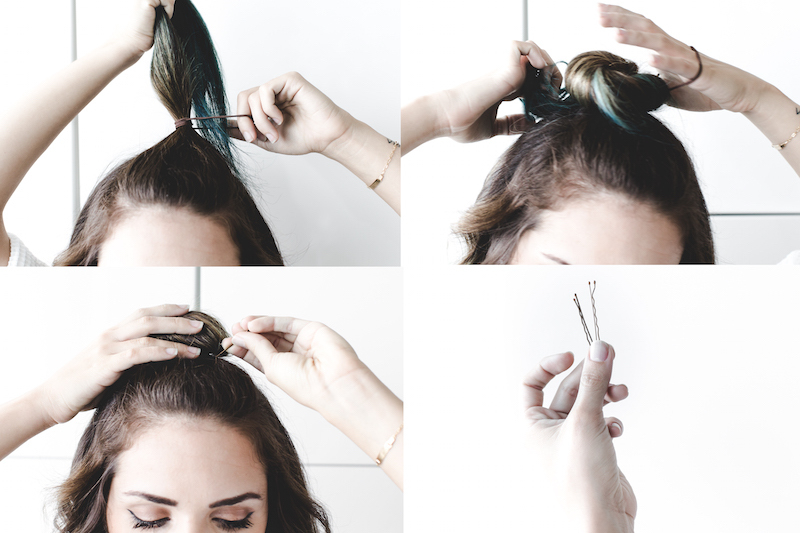 Just like you would do a regular top knot, twist around and secure with a hair tie. Finally I like using a bobby pin to make the bun a little flatter. I got the MetaGrip Premium Hair Pins in Bronze- which are slip proof so that little bun won’t move anywhere. …and we are ready!! Wait!! The final touch to make this look more glam: red lipstick. Here I’m wearing Femme Couture Primer Wear Lipstick in Blushing Red. Disclosure: This post was part of a three month partnership with Sally Beauty. All opinions are my own.